Much of Syria comprises desert plateaus with elevation ranging from 200-1,000 metres. Low precipitation means water resources are scarce. As a result of rapid population inflow from rural areas coupled with industrialization, urban areas suffer from water shortages, groundwater aquifers are heavily overexploited and, with almost one third of total water resources originating outside the country, the need for sustainable and strategically planned water resources management becomes apparent. Rain is the main water resource in Syria, affecting the availability of all other water resources. The average annual rainwater resource is estimated at 46 billion cubic metres (BCM). In drought years, this figure is much lower. Furthermore, the rainfall is unevenly distributed in both space and time. Rain and sometimes snow fall between October and May, mainly in the mountains. The country is divided into five zones based on the average annual precipitation. Zone I: covers some 2.7 million hectares (ha) and has an average annual rainfall of 400-650mm. Zone II: covers about 2.5 million ha and has an average annual rainfall of 300-400mm. Zone III: covers about 1.3 million ha and has an average annual rainfall of 300-400mm. Zone IV: covers about 1.8 million ha and has an average annual rainfall of 100-200mm. Table 1. 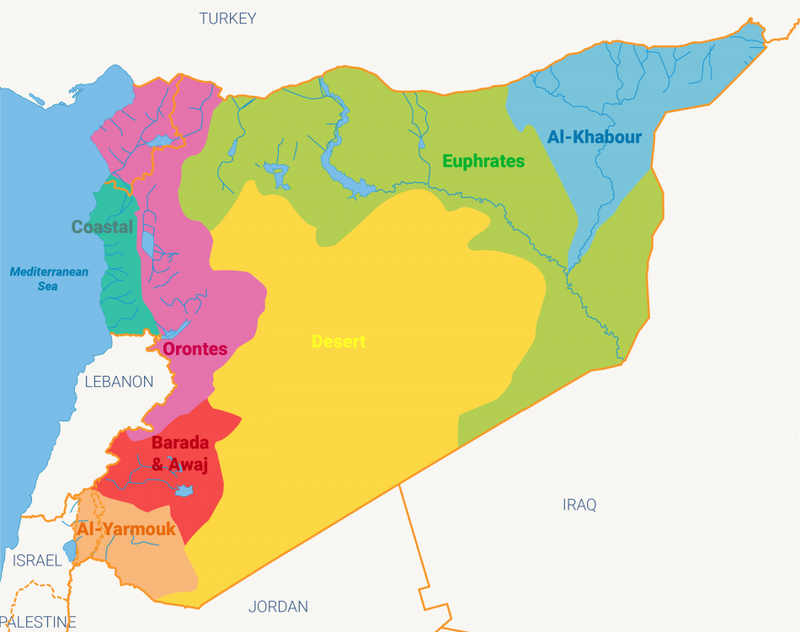 Water basins in Syria . Figure 1. Percentage of total available conventional water in the water basins of Syria. 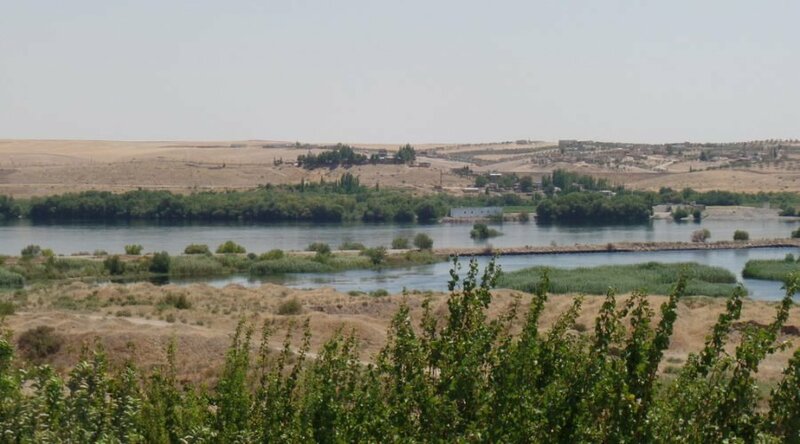 There are 16 rivers and tributaries flowing in Syria, five of which are internationally shared (Euphrates, Tigris, Orontes, Yarmouk and Khabeer al-Janoubi). Their flow constitutes almost 75% of the country’s total organized surface water resources and over 45% of the water resources available for use. The total surface water resources (excluding the Tigris since its water is not used by Syria) are 10BCM/yr. Table 2. Rivers in Syria. Groundwater is available in most of the country’s geological formations. Some of the main aquifers are non-renewable (fossil water), and their exploitation is considered as mining. Historical and actual data indicate that the groundwater withdrawal far exceeds the natural recharge rate in almost all areas. The main groundwater aquifers are those of Anti-Lebanon and the Alawite mountains. There are several springs discharging from this transboundary groundwater aquifer system, such as the Ari-Eyh, Barada, Anjar-Chamsine and Ras el-Ain. Recharge to the system occurs from heavy precipitation in the mountainous regions. which infiltrates through karstic layers. Total actual groundwater inflow is estimated at 1.33km3/yr, of which 1.20km3 is from Turkey and 0.13km3 is from Lebanon (Dan springs). Groundwater outflow to Israel and Jordan is estimated at 0.25km3/yr and 0.09km3/yr respectively. Table 3. Lakes in Syria. Twenty-six wastewater treatment plants (WWTPs) are in operation, with a total capacity of 821,000m3/day or 299 million cubic metres per year (MCM/yr). There are only four major centralized WWTPs in the main cities: Damascus, Hama, Homs and Aleppo. The remaining 22 WWTPs are decentralized, with capacities ranging between and 400 m3/day. However, most WWTPs are not working to their full capacity. Only eight MCM/yr of treated wastewater from the major WWTPs is used for irrigation. The use of treated wastewater has the potential to cover 3% of the total water demand in Syria. Table 4. Reuse of treated wastewater in Syria. In Syria, desalination of seawater has only marginal value, and the total desalination capacity is 8.18m3/day, which amounts to less than 3MCM/yr. This is approximately 0.01% of the total water withdrawal, and therefore the importance of this component is negligible. The use of desalinated water is limited to industrial purposes only. On the one hand, desalination costs are high; on the other, the sea is far from the water-deficit areas. Rainwater harvesting is a technique to collect and store rainwater for later use. Syria has great potential to secure additional water resources using this technique. Of the BCM of annual rainfall, only 9BCM is effectively used. The remaining BCM is lost through evaporation, percolation and runoff to the sea. Roof rainwater harvesting in rural areas alone would save more than 35MCM. Not much is known about the potential if this were combined with other rainwater harvesting techniques in both urban and rural areas. Available water resources per capita declined from 12,185m3 in 1992 to 809m3 in 2012, whereas the actual renewable water resources were on average 1,250m3 (see Figure 2). In the Middle East and North Africa (MENA), Syria is one of the better off countries in terms of water availability. Even so, per capita availability is below the internationally set level for water scarcity of 1,000m3 per capita. 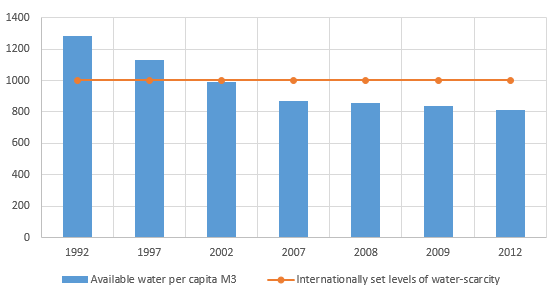 Figure 2: Water availability per capita between 1992-2012. Aw-Hassan, A., Rida, F., Telleria, R. and Bruggeman, A. 2014. ‘The impact of food and agricultural policies on groundwater use in Syria’. Journal of Hydrology 513, 204-215. Ministry of Housing and Construction. 2011. Wastewater treatment plants performance report. Mourad, K. and Berndtsson, R. 2011. ‘Potential water saving from rainwater harvesting in Syria’. Vatten 67:113-117.